All streets intercrossing Placa street have a standard width, strictly defined by statute from the days of the Dubrovnik Republic. Only exception to this rule is the Siroka ("Broad") Street. Siroka street is about three times as wide as the standard street width. The reason for this is of practical nature. Up street of Siroka the granary building had been located. hence a quick access to this important facility was required hence the broad design of Siroka street. Throughout its history Dubrovnik had an emphasis on grain storage and distribution and it is understandable as in medieval times the supply of grain was as important as supply of ammo whether for siege or scarce years. The City had several grannaries from which "Rupe" (meaning of Rupe is "Holes") are the biggest and architecturally the most interesting. The building of Rupe granary was between the period of 1542 to 1590. The Rupe granary was built as a three storey high building. However the top floor was demolished in the early 20th century during the Austrian rule of Dubrovnik. The bottom floor has 15 large dry wells that were drilled into the live rock beneath the building. The capacity of the holes is about 150 wagons (1500t) of grain in bulk. The intricacy is that the holes have a constant temperature throughout the year (17.5 °C). The two storeys above the holes were used as a horizontal storage plane, a grain dry-kiln, and with a system of canals and floor oppenings the grain was poured down to the holes on the ground floor. Today Rupe granary is a museum and in addition to the featured historic function the Ethnographic collection is hosted as well. 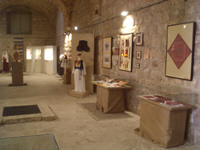 In the Ethnographic collection you can see many tools and artefacts from the ordinary life of people in Dubrovnik region, National costumes, and other exhibits related to Dubrovnik customs throughout history of Dubrovnik. At the end of the Siroka street The Domino church is located. The church was built in 1452, as the only 3-nave church with rectangular apse. It was destroyed in the great earthquake of 1667 and was rebuilt in baroque style during the same century. It contains the 17th century altarpiece “The Glory of all Saints” by Andrea Vaccaro. It is used to be the seat of the fraternity of the stonemasons. Adjacent to the church one can visit the Marin Držić Memorial Museum dedicated to this renowned Dubrovnik playwright. Marin Držić is a Dubrovnik playwright and poet from the 16th century. In his works the plot is built around common human themes, desires and traits: love, want for youth, and most notably penuriousness. The characters in his plays are based on real people from his own time. His most famous works are Tirena, Grižula, Venera and Adonis, Novela od Stanca, Skup, Hekuba, and Dundo Maroje. In comedy Dundo Maroje Drzic described a vision of society where everyone is equal, with no difference between good and evil, describing the main characteristic of his own time - penuriousness. 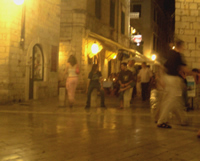 Marin Držić plays are commonly performed as a part of the Dubrovnik Summer Festival programme.